QSE (515-66) Deluxe 39Hi Wet Booth Unit w/two drawers, cabinet w/adjustable shelf, blow dryer holder, three curling iron holders, clipper pocket, and UL listed six outlet power strip. ... plus a bottle well for shampoo/conditioners behind the bowl and lift lid over the bowl. 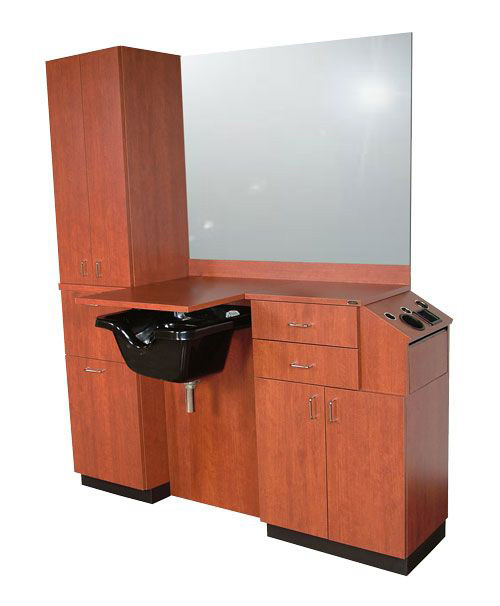 66"W x 16"D x 39"H. The taller cabinet allows shampoo bowl to be mounted 3" higher than a standard-height wet station. Order bowl and mirror separately. * This item number available in "Matte Black" only.